We ran out of boxes when we were moving and ended up using a ton of bags instead. Boxes are a bit more sturdy, in most cases, and are arguably easier to carry. They also make for a fantastic children’s toy. Bags, not so much. For me, making comics isn’t really all that much of a challenge anymore. I mean, I still struggle every now and then, and I’m constantly pushing myself, but I like to think that drawing comics is something I’m good at. Writing comics, on the other hand, is extraordinarily difficult. The problem I’m facing lately is the feeling that I might be trying TOO HARD to write funny comics. I tend to overthink things, and hold myself to very high standards of professionalism when it comes to my work. Lately, I’ve been trying to write more loosely, and instantly run with any funny idea I have, instead of analyzing it to death, trying to make it perfect. I can’t tell if the comics have improved since I’ve begun writing this way, but it has certainly sped up the process, allowing me to spend more time on the art. Are the jokes more pure this way? More natural? I have no idea. I’m just thinking out loud, trying to figure this all out. Another way I tried to solve this problem of mine is by writing a graphic novel. I learned a lot about writing by doing this, but what I learned doesn’t really apply to a gag-a-day style comic like Massive Pwnage. Writing a long-form story with a definite end is completely different from what I do here. I have had some success using a sort of combination of both styles of writing when I write story-arcs for Massive Pwnage. Maybe that’s what I need to focus on. Telling a story. I suppose you could say that that’s the entire point of this medium. This entry was posted on Wednesday, October 3rd, 2012 at 12:00 am and is filed under Comics. You can follow any responses to this entry through the RSS 2.0 feed. Both comments and pings are currently closed. I think I like your comics much more when you’re making an Arc or when Ence and Locke are hanging out with Tika and Alice. Telling a story should definitely be your priority, comics like this one certainly tell one! 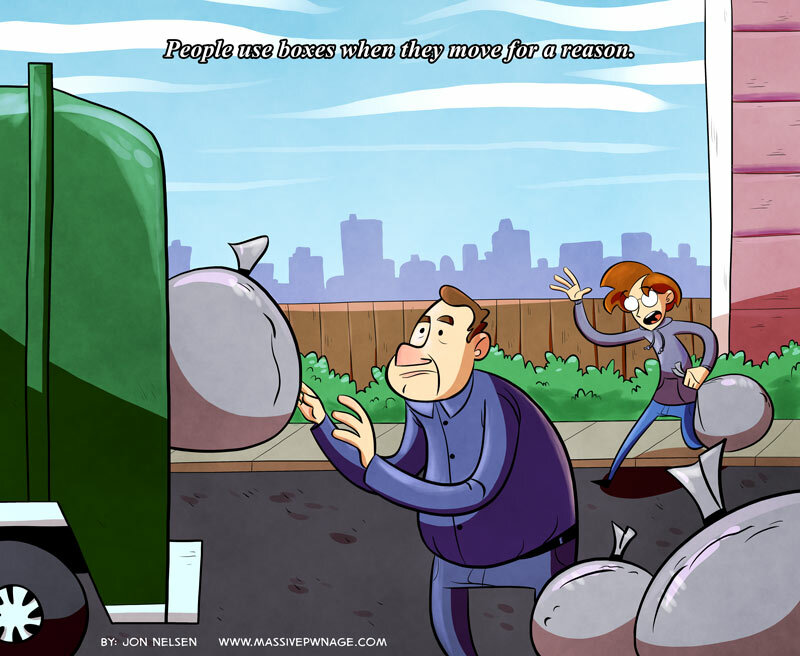 Having recently moved (and used some bags) I can imagine this happening to some poor soul. As Axel said though, I really enjoy the story arcs and they keep me checking back for updates.. Although I check every day anyway. That said between story arcs, or sometimes during if it’s particularly relevant to some recent event, a selection of gag-a-day comics are always very welcome. Keep up the good work, I really enjoy it. I definately miss some of the story arcs, but the gag-a-day are funny also. It would be good to return to the story arcs that tell about the original story of this comic, but the decision is ultimately up to you. I basicly just wan’t to say, that no matter what you end up doing, I for one will probably enjoy it just as much as I always have! Cheers mate, and keep up the good work. Thanks so much! I love doing both styles of comics, I think I might just need to work harder at balancing the two. It’s all still a work in progress. Even after five years, I’m still trying to figure it all out!